Messina Hof Winery and Resort, one of the fastest growing and award-winning wineries in Texas, recently announced its winning wines for the 2012 San Francisco Chronicle Wine Competition. The San Francisco Chronicle Wine Competition was held on January 3rd-5th in San Francisco, CA. Wine entries included 5,500 wines from across the United States, making it the largest competition of American Wines in the world for the ninth consecutive year. Medals were awarded by a panel of 65 judges consisting of local and national wine experts. Messina Hof Winery received seven medals at the competition, including a gold medal for Messina Hof’s Cream Sherry Solera. Four silver medals and two bronze medals were also brought back home to Texas, representing the Lone Star State well. Messina Hof’s awards placed them in the top 10% of all wineries entering the competition. All top-winning wines will be available for a public tasting on February 18th 2012 from 2-5pm, at the Festival Pavilion in the Fort Mason Center, San Francisco, CA. 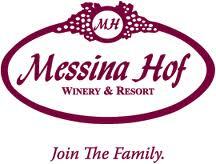 Messina Hof’s gold-winning wine, Cream Sherry Solera, will be available to taste at the event.